In what’s likely one of the last Holocaust trials, this one lasting four months, a German court sentenced Reinhold Hanning, 94, to five years in prison. Under a retroactive law passed in Germany in 2011, it is considered a crime to have worked in any capacity at one of the Nazi death camps. Hanning was found guilty for his complicity as a guard in the mass murder of 170,000 people at Auschwitz in Nazi-occupied Poland. According to a handwritten CV he wrote while stationed at Auschwitz, Hanning joined the Hitler Youth at 13. At 18, he volunteered for the Nazi Waffen SS. After being wounded in battle, Hanning convalesced at Auschwitz. He stayed at the death camp as a guard and was promoted twice during his tenure from 1942 to 1944. Hanning’s lawyers argued for a not-guilty verdict, saying that there was no proof of direct participation in the killing. Hanning remains free pending an appeal. Leon Schwarzbaum, another survivor from Berlin, said he would have liked Hanning to use the trial as an opportunity to speak more about what happened at the camp so that future generations would know. One of the most dramatic moments of the trial came when Schwarzbaum took to the witness stand and told Hanning to speak out before he died. “Mr. Hanning, we are virtually the same age and soon we will face our final judge. I would like to ask you to tell the historical truth here, just as I am,” he said. 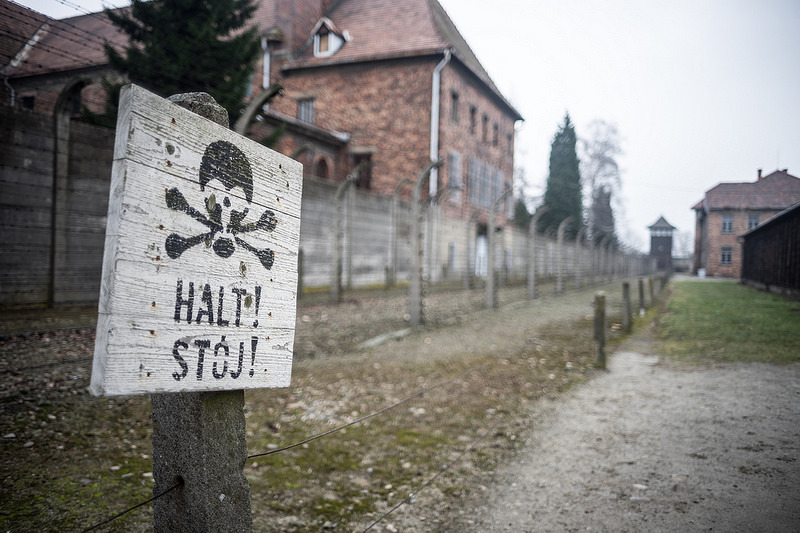 An estimated 1.1 million people were killed in Auschwitz, and 90 percent of those killed were Jews. More than three-quarters of the prisoners were marched directly from the railway cars to the gas chambers.Last year, a 94-year-old former SS guard at Auschwitz, Oskar Groening, “the bookkeeper of Auschwitz,” was convicted on 300,000 counts of accessory to murder. [Arendt] insisted that only good had any depth. Good can be radical; evil can never be radical, it can only be extreme, for it possesses neither depth nor any demonic dimension yet—and this is its horror!—it can spread like a fungus over the surface of the earth and lay waste the entire world. Evil comes from a failure to think. It defies thought for as soon as thought tries to engage itself with evil and examine the premises and principles from which it originates, it is frustrated because it finds nothing there. That is the banality of evil.